UK, 1967, 92 minutes, Colour. Bette Davis, James Cosines, Jack Hedley, Christian Roberts, Sheila Hancock, Elaine Taylor. 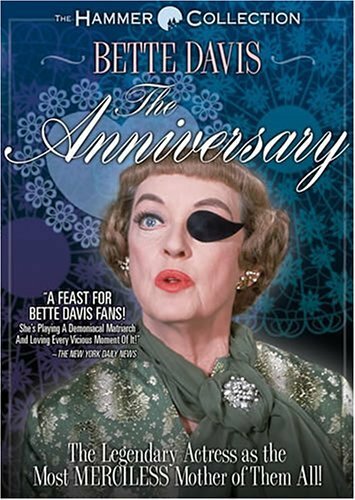 The Anniversary is only for those who have a taste for the macabre, especially the Bette Davis style. Here, after five years at Whatever Happened to Baby Jane? Hush, Hush, Sweet Charlotte, The Nanny and so on, she plays one of the most horrific Mums you could ever meet, a modern Gorgon with one eye and a coloured patch. The film is very black comedy, satirising family relationships and mother dominance. It is based on a play and so the action is confined. But Bette Davis' bravura performance and the clever British supporting cast keep the film moving. Although the film is ugly, it is fascinating to watch and certainly raises many questions. 1. How seriously was this film meant to be taken? Why? Was it realism? satire? caricature? 2. The structure of the film was based on that of the stage play, it took place over a few hours one afternoon and evening? Did you notice this? What effect did it have on the drama? 3. What were your first impressions of each of the sons, Henry and his worries, Terry's anger and his attitude to his job, Tom and Shirley and his attitude towards the others? Did your opinions change? 4. What did the building firm and its methods reveal about the Taggers? 5. Did you like Shirley and her first appearance? Did your opinion of her change? 6. How effective was the build-up for Mum's first appearance? Henry and the flowers, Karen and the children. Shirley being briefed by Tom and Mr defiance about performing an item? 7. What were your expectations of Mum before her appearance? Did you think you were going to like her or dislike her? Why? 8. Did Mum fulfil your expectations, her manner, her eye and eye patch, her dress, her reaction to the gifts, her attitude towards her sons, to Karen, to Shirley, giving the coins to the children, to getting Henry to drive the children home? 9. How did Mum regard Henry, his 'perversion' (were you surprised? why had he gone partly mad? did it prevent him doing worse things, as he said?) her getting him to do things. her threats of handing him over to the police, saying he would marry a nice girl; did she love him? 10. How did Mum regard Terry? He thought M loved her, She blamed him for the loss of her eye, Her payments for the babies, her not wanting to migrate, her tactics of buying a house, pretending that the children were in the accident, her using of the stolen underwear being in his car to stop him going, her using his sense of responsibility for Henry to stop him, His final realisation that he had wanted her to love him and she did not, How lucky was he in having Karen? Was she a good woman, wife and mother? Was she entitled to swindle Mum out of the money? How cruel was Mum to her about the children in the accident? 11. How did Mum regard Tom, did she love him? His escape by philandering. her liking of his present and his vulgarity. her rudeness to Shirley, her using of Shirley in arguments, his revenge by using her bed. her leaving the glass eye in the bed. 12. By the end of the film how did you regard Mum, her getting upset if she didn't get her own way, her cutting rudeness, using people, self-centredness, hatred, tightfistedness in the firm, her cruel resourcefulness, her charm to the man who needed the floorboards down, her using of the anniversary? 13. Were Terry and Tom right to walk out? Did they now have a future? What role did Karen play for both of them? What role did Shirley play? Do you think Shirley would have become another Mum, or did the screenplay indicate that she would not? 14. Why did Mum keep up the pretence of the Anniversary when she hated Dad? 15. Do you think Mum's revenge on them would have been effective? She had the last laugh in the film? Do you think she would have won completely? 16. How did Bette Davis' performance contribute to the making of such a repulsive MUM? How did the screenplay? How ludicrous was Mum? Why? 17. This film was made by Hammer Films, the specialists in horror movies. Do you think they used some of these techniques to make the film more effective?